Sorrento on the Mornington Peninsula was the first site of European settlement in Victoria, in 1803. The mansion, Nee Morna, was build in 1909 and has been put up for sale by New York-based banker Alex Lipe. It is only the second time the 4-acre property has been put up for sale in the last century, according to real estate agent CBRE. CBRE expects the property to fetch more than $20 million. Nee Morna, which means “Laughing Water” in the language of the Bandjin and Djiru people, was named by the man who built it in 1909, shipping magnate Walter Howard Smith. Nee Morna is one of the original, historical mansions of Sorrento and its ownership, including the prime, clifftop land on which it sits overlooking Sorrento and Port Phillip Bay has been held by prominent Australian families since its establishment, including George Coppin, and Walter Howard Smith. The Estate was purchased in 1875, together with other prime land in Sorrento totaling 95 hectares (225 acres), by The Ocean Amphitheatre Company, a company formed by George Coppin (a distinguished actor, politician, and entrepreneur) to promote Sorrento as an exclusive seaside resort, principally for residents of Melbourne and its visitors. To that end, Mr. Coppin was highly successfully, and he is universally acknowledged as the “father of Sorrento” for his many important local endeavours including: establishing a daily paddle steamer ferry service from Melbourne to Sorrento (1874); building the Sorrento Continental Hotel (1875), the Sorrento Baths (1875), and the road now known as Ocean Beach Road (1889); and establishing the Sorrento Tramway (1889). Nee Morna, a majestic Federation home standing on the Western Sister headland above Sorrento, will undoubtedly be one of the jewels in the crown this summer. Acquired by Mr Lipe a decade ago and carefully restored to its former glory over the last four years, its roots trace right back to the establishment of Sorrento 140 years ago as the exclusive seaside retreat for Melbourne’s business elite. The 1.7-hectare site upon which Nee Morna stands – the largest in Sorrento – was once part of a 95-hectare estate acquired in 1875 by the Ocean Amphitheatre Company. This was a company formed by George Coppins, the actor, entrepreneur and politician who is credited with putting Sorrento on the map. The “fine elevated site” was purchased by Walter Howard Smith in 1909. Mr. Howard Smith was one of Australia’s most successful shipping merchants who, together with his brothers, built the Howard Smith Co. formed by their father, in 1854, into Australia’s leading shipping company. Originally formed to supply goods to the Victorian goldfields, the business became a major transporter of coal and of passengers, including the operation of ferry services from Melbourne to Sorrento. By this time, Sorrento had become the premier summer resort for wealthy Melbourne families and, while his younger brother, Bellingham Howard Smith, built “Colwyn” just beyond the Sorrento village, Walter built “Nee Morna” atop the “first sister”. Ursula de Jong , the president of the Nepean Conservation Group and deputy chair of the National Trust of Victoria, told ABC Radio Melbourne the property was extremely significant. “[The area] was the first attempted settlement site by British in Victoria, and it predates settlement in Hobart,” Ms de Jong said. An historic mansion and four acres at Sorrento are being offered for sale. Ms de Jong hoped the Andrews Government would step in and protect the site. “It’s priceless. In terms of our heritage, if we don’t protect it and care for it we lose something about our own identity,” she said. “Always the danger with selling is… they always try and argue for development and I think it would be terrific if the State Government bought it and it went back into public hands,” she said. The property overlooks Sullivan’s Bay, Blairgowrie Yacht Club and Arthur’s Seat. Seller Alex Lipe said he enjoyed “boisterous Christmas lunches, … formal black-tie affairs and fancy dress parties” in the dining room. CoreLogic records indicate Mr Lipe has owned the 1.69ha clifftop property at 3106-3118 Point Nepean Rd for almost 10 years. The home’s formal living room — one of five living/dining rooms. The prized site, the largest landholding in the exclusive seaside suburb, consists of four separate titles which buyers have the option of snapping up separately or together. All four titles offer stunning views of Sorrento and Port Phillip Bay, and the largest features a mansion that dates back to 1909. Mr Lipe restored the home to its former glory during his time there. The house spans three floors with six bedrooms, five living and dining rooms with soaring 4m-high ceilings, four bathrooms, a kitchen with separate food and butlers’ pantry rooms and a wine cellar, and a wraparound veranda. The large kitchen features European fixtures, fittings and finishes. CBRE director Mark Wizel expected Nee Morna to appeal to buyers as both a residence, offering the opportunity to move straight in, and a potential development site, with both residential and commercial prospects. The latter included an aged-care facility, conference or business centre, or a hospitality venture. He said the offering benefited from a “premium position” in an area that had enjoyed significant property price growth over the past decade, boosted in part by growing interest from offshore buyers keen to capitalise on the State Government’s $759 million Peninsula Link project. The view from one of the home’s six bedrooms. 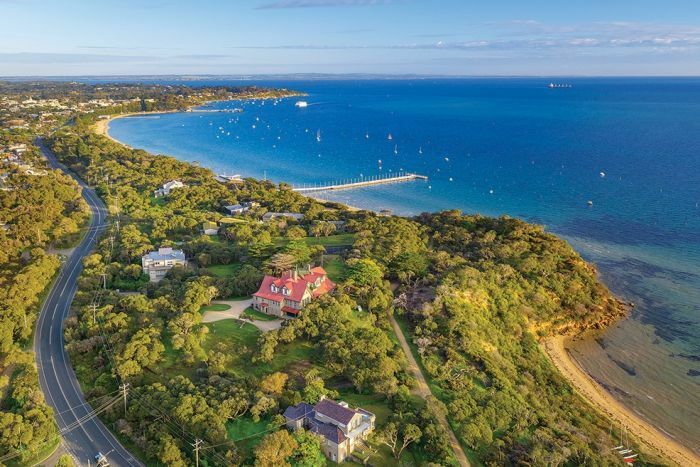 “Properties such as the Red Hill Estate Winery, Eagle Ridge and Moonah Links Golf Course are all examples of strong Chinese interest that is moving into this part of Victoria,” Mr Wizel said. Nee Morna is being sold via an expressions of interest campaign ending at 3pm on February 28.